Verse 114: Better than a hundred years in the life of a person who does not perceive the Deathless (Nibbana), is a day in the life of one who perceives the Deathless (Nibbana). While residing at the Jetavana monastery, thc Buddha uttered Verse (114) of this book, with reference to Kisagotami. Kisagotami was the daughter of a rich man from Savatthi; she was known as Kisagotami because of her slim body. Kisagotami was married to a rich young man and a son was born to them. The boy died when he was just a toddler and Kisagotami was stricken with grief. Carrying the dead body of her son, she went about asking for medicine that would restore her son to life from everyone she happened to meet. People began to think that she had gone mad. But a wise man seeing her condition thought that he should be of some help to her. So, he said to her, “The Buddha is the person you should approach, he has the medicine you want; go to him.” Thus, she went to the Buddha and asked him to give her the medicine that would restore her dead son to life. She left the corpse in the jungle and returned to the Buddha and reported that she could find no house where death had not occurred. Then the Buddha said, “Gotami, you thought that you were the only one who had lost a son. As you have now realized, death comes to all beings; before their desires are satiated death takes them away.” On hearing this, Kisagotami fully realized the impermanence, unsatisfactoriness and insubstantiality of the aggregates and attained Sotapatti Fruition. Soon afterwards, Kisagotami became a bhikkhuni. One day, as she was lighting the lamps she saw the flames flaring up and dying out, and suddenly she clearly perceived the arising and the perishing of beings. 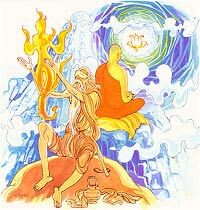 The Buddha, through supernormal power, saw her from his monastery, and sent forth his radiance and appeared to her in person. Kisagotami was told to continue meditating on the impermanent nature of all beings and to strive hard to realize Nibbana. At the end of the discourse Theri Kisagotami attained arahatship.